Weight/Length: I think she'll always be a teeny little peanut, but I love my little Polly Pocket : ) She weighs 11 lbs. 13 oz. and is 23 inches long. Her head circumference is 39 cm. Hair: LOTS. A lovely chocolate brown. She kept all of her newborn hair and apparently loves to show it off, because she likes bows and whimpers when we take her headbands off, but hates hats. That's my girly girl! Diapers: Size 1 Pampers Swaddlers. Favorite Things: Her Sophie the Giraffe toy, her pink monkey lovey and her V-tech faux "iPhone", which plays music. Likes: Right now, our petite princess loves: having books read to her, watching TV, (go ahead and judge us - it keeps her happy while I cook dinner), listening to music (her fav is the Billie Holiday station), going shopping with momma, playing peek-a-boo with daddy and taking baths. Dislikes: Having her feet touched, wearing socks or shoes, people with loud laughs, (we think it startles her). 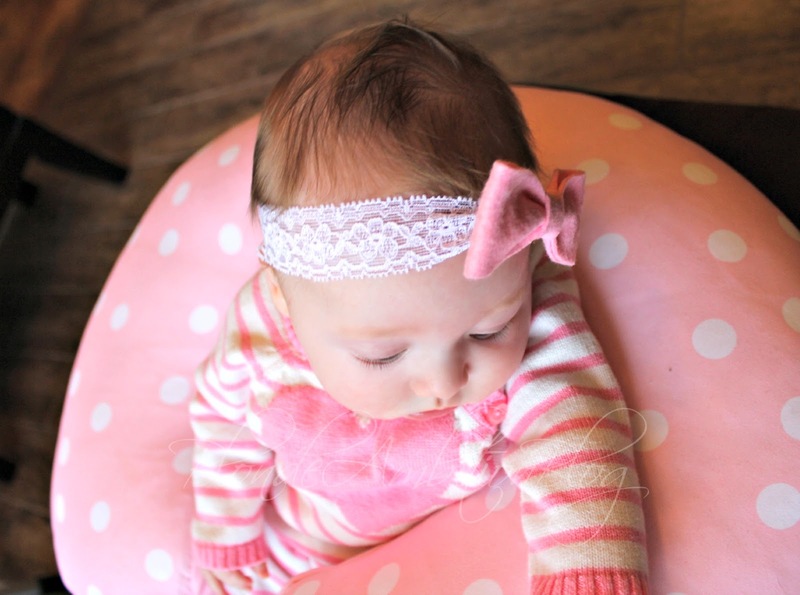 Milestones: She rolled over from back-to-tummy on February 9th! 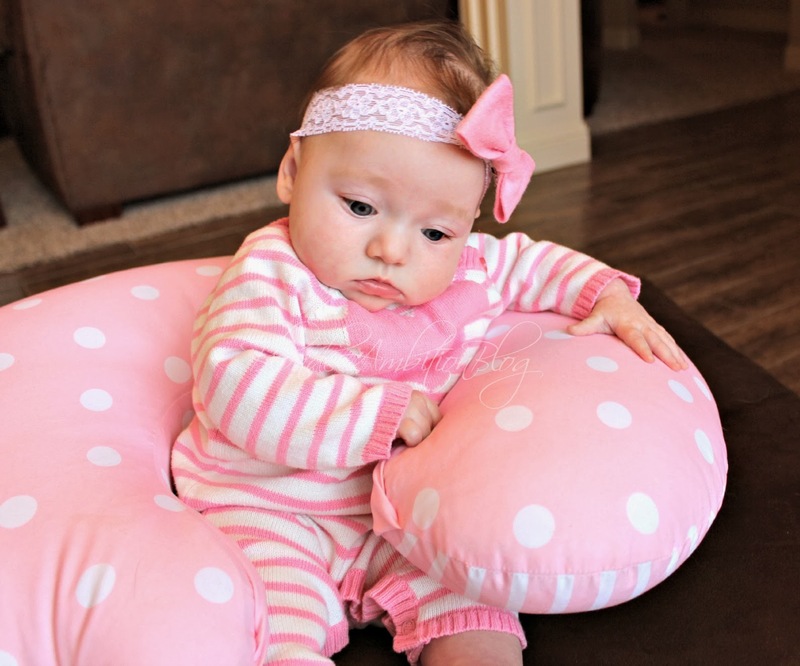 She is also able to fully support her head and neck, bear her body weight on her legs with us holding her underarms, prop herself up on her hands and use her elbows to scoot for a few inches at a time. She has also started laughing out loud and babbling SO much. She is also learning to lift her little arms up when she wants to be picked up, which I adore. Sleeping: She is sleeping amazingly well. She goes down around 8 p.m. and wakes around 8 a.m. most mornings. She takes one 2 hour nap in the mornings, then another one-hour nap around 2:00 p.m., then her final nap around 5:00 p.m. for an hour or so. I've had a few questions regarding how we got her to sleep through the night. I will say, we never did any sleep training, per se. I don't believe in letting a baby "cry it out" either, and I think there are much better ways to help them sleep longer. She has also been exclusively sleeping in her crib since around two months. If you have specific questions about our sleep routine now, feel free to email me. I'm not an expert by any stretch, but Caroline is sleeping soundly, so something's working. Mama Thoughts: We dealt with that horrid bout of RSV around the end of January and we are still in recovery mode from that. There unfortunately have been a lot of issues with the daycare facility we were using, so we are currently in the process of finding a nanny/sitter for the two days a week that I'm in the office. Nothing against daycare at all, but for our family, we feel it's the right decision right now. It has been THE BEST opportunity ever to be able to be at home with her primarily. I love our days together and especially enjoy being able to witness a lot of her "firsts" that I was afraid of missing. My favorite time of the day is when I can hear her stirring in the morning and I go in to get her. She lets out the biggest giggle and always greets me with a huge smile - melt me!! The hardest thing I've faced lately is just the challenge of balancing all my different roles. I'm a mom, a wife, a career woman, a friend, a church member, a blogger (in the loosest sense of the word). I will admit that I had five minute cry the other evening, just a few hours before the Mom Chats were supposed to happen. Caroline was running a fever, which we attributed to an RSV flare-up and was cranky as a result. I also had two work assignments due the next day. On this same night, I also realized I hadn't cooked a proper meal in five days. I just felt incompetent and disorganized and I hated it. But Stephen reminded me that sometimes we just have to prioritize and push some things to the back-burner while the rest of the things finish cooking, so to speak. That's it until March 14th when we have a - gulp - FIVE MONTH OLD! Our little man is always on the lower end of the weight spectrum, but he is long. We like to joke around that maybe he will be tall and thin one day. So, in my opinion, it's perfectly ok to not have a super chunky baby! :) Caroline is just perfect! And no judgement here on the tv, Mama! We let Caleb watch the Mickey Mouse Clubhouse once in a while because he LOVES it and it allows us to get things done that have to be attended to. But we don't use tv as a babysitter or anything of the sort! I think it's just fine! beautiful! And no judgement here, if Easton didn't "watch" Mickey House Clubhouse in the morning there is no way in heck I would get out the door in time. Don't stress! I don't cook dinner nearly as much as I would like, have abandoned my blog virtually but I love my kids and spend as much time with them as possible and that's what counts! And on the child care it is never an easy decision but it needs to be the right fit for your family and most importantly Catoline! Look at a church with a Mother's Day Out program, it has been a great fit for us and we love it! Best of luck! Sending lots of love your way! One day you will look back on this and realize how much you have grown and learned during the early days as a Mom. Everyone loves to brag on their huge babies, but I had 4 of the tiny type. When my only daughter turned 1, she weighed 16.5 lbs. The dr wanted to run a huge amount of tests on her, ONLY because of her weight! She was already walking, height/weight proportionate, said mama and dada, and was developmentally ahead. I told him no way. No symptoms, no tests. She is now 12 and still tiny for her age, but lovely. She's kind, smart, and a total joy to us. God makes people in all sizes, but for some reason, the small babies are so concerning. Hi Leslie! 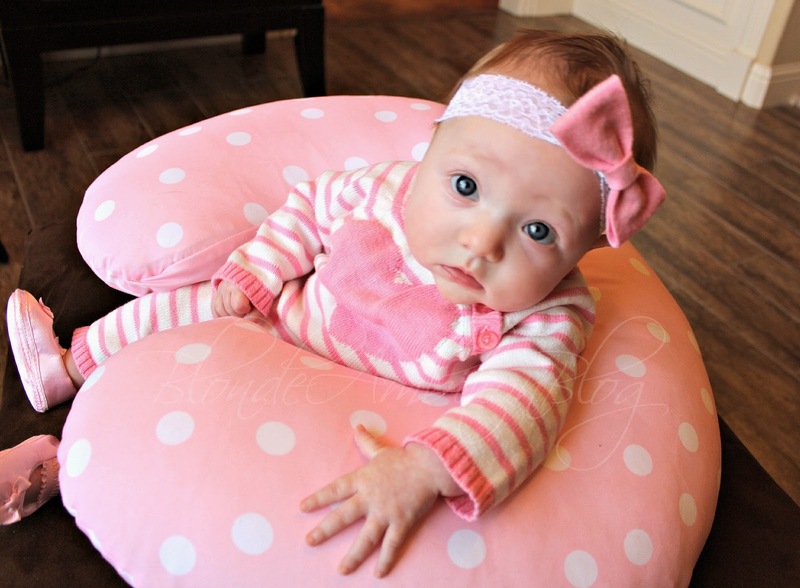 I loved this post- so cute :) Before Caroline was in her crib, which bassinet/sleeper did you use and did you like it? Thank you! !